Medical And Health Recruitment Board, Assam Recruitment 2018 | Demonstrator, Lecturer, Registrar [54 Posts] :- Hello Assam Career Job Aspirants. 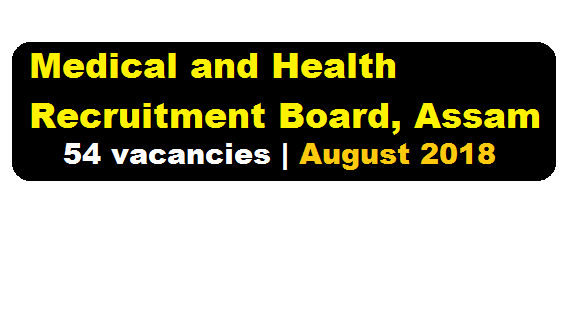 Medical and Health Recruitment Board, Assam has recently published another recruitment notification in the month of August 2018. In continuation of this advertisement No. 04/2018 vide No. 9/MHRB/Recruitment/5/31 Dated Guwahati the 11th June, 2018 and in pursuance of Govt. letter No. HLB.543/2011/166 Dated Dispur the 8th June, 2018, it is notified for information to all concerned that, there are another 54 (fifty four) posts of Registrar / Resident Physician / Resident Surgeon / Demonstrator / Anesthetist / Resident Pathologist etc. in various Departments of Medical Colleges in the State of Assam under the Health & Family Welfare (B) Department in addition to the nos. of posts advertised earlier. We have detailed information shared regarding the posts od Registrar / Resident Physician / Resident Surgeon / Demonstrator / Anesthetist / Resident Pathologist etc. as communicated by the Govt. in below section. In this section, we will discuss in detail about Recruitment of various posts under Medical And Health Recruitment Board, Assam Recruitment 2018 August with all the details and requirement. Salary/ Pay : Rs.15,600- 39,100/- PM AGP=Rs.6000/- plus other allowances as admissible under Rules. (i) 21 Years to 38 Years as on 01/01/2018. The Upper age limit is relaxable up to 5(five) Years in case of SC / STP & STH candidates. (ii) Relaxation for Upper Age will be considered as per existing Rules. a) Application must be accompanied with required application fee of Rs. 250/- (rupees two hundred fifty) only for General category candidates and Rs. 150/- (rupees one hundred fifty) only for OBC/MOBC/SC/ST (P)/ST (H) candidate. Online application will be received till 13/08/2018. Applicants have to produce the original testimonials including the copy of original Treasury Challan along with the downloaded applications, during the time of interview, schedule of which will be published in the website https://nhm.assam.gov.in in due course of time. All applicants are advised to visit the website accordingly. No TA/DA will be paid for attending the interview.